The majority of internet users (including ourselves) depend on search engines to find websites or businesses related to their subject of interest. With the increased usage of search enabled mobile devices, the search has become one of the most performed online activity. 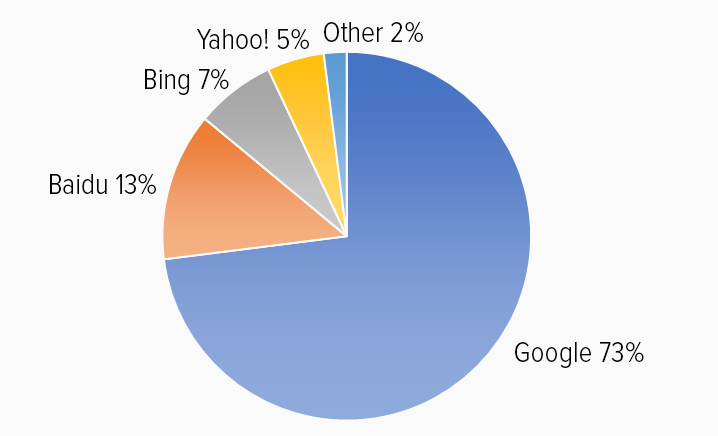 Google leads the herd of search engines with 73% usage. Search engines are actually programs created to catalog web pages and help you find them using the specific keywords that you type in as query. The cataloging process is also termed indexing, crawling or spidering and the programs are referred to as search engine robots, spiders or crawlers. It is becoming increasingly important to get your website found on search engines, especially Google. Over 100 billion searches are performed in a month. That number stress the importance of having your website or online business come up in search results. Increase in Web Traffic – You will clearly see an increase in traffic to your website. The beauty of search traffic is that… it is free!! Better Conversion Rate – Your website’s overall conversion rate increases, whether it is a simple sign up or a sale. Consumers give more trust and credibility to organic search results than paid results. Higher Branding – Better search results means better brand recall. Users will be seeing more of you… and they will start associating you as a brand. Get a Better Edge Over Your Competitors – You can create an edge over your competitors and stand out by implementing search engine optimization. Significant increase in ROI (Return On Investment) – Search engine optimization is an online marketing strategy that has better returns on the amount you invested. If you are on a tight budget, you can even do it free of cost! Search engine optimization has two aspects – on-page optimization and off-page optimization. On-page optimization is the process of making your website search engine friendly. Off-page SEO involves building up inbound links and social signals. Today, we are going to discuss 5 critical elements of on-page optimization. By employing these tactics, you can build a solid SEO friendly website. Before you start out, I want you to be very clear on the primary keywords that you’re focusing on for each page. 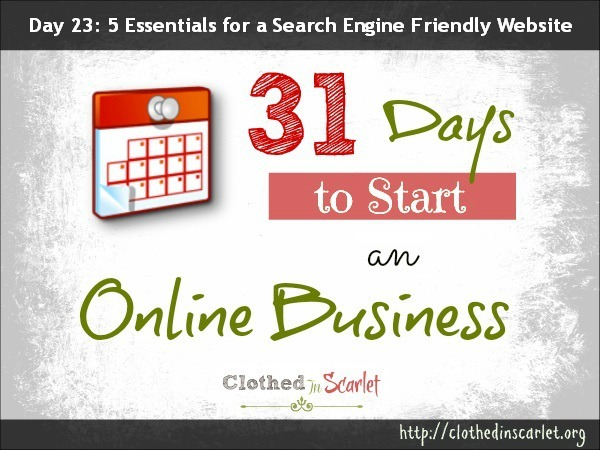 I mentioned few SEO tips on Day 21 – Create Content for People and for Search Engines. Do check that article as well. The content that you place on your website has to be indexed by search engines for it to come up in search results. Even with technological advancements, search algorithms (search engine programming) on search engines are still not able to completely index flash components, video, audio and images on your website. HTML text is the most indexable content format. But that doesn’t mean your website has to contain only text and nothing else. It just means that when you use other forms of content, make sure you add some text also to substantiate the other content formats. Adding transcripts for audio and video content is a good way to make it easily indexable. Please don’t create your homepage with flash content alone. I literally cringe every time I see such a website. Search engines cannot index what you have put there and flash takes forever to load. By the time your beautiful website loads, visitors would have clicked the back button. The title of a web page is one of the most important on-page optimization factors. Search engines look to your title tag to tell them what the page is all about. An optimized title tag should include the primary keyword but it should not exceed 70 characters. Do avoid stuffing keywords in your title tag. Google and other search engines frown upon the excessive usage of keywords in your title, and might even ban your site from their search results. From an SEO perspective, how you structure your URL is very important. Follow the below steps for URL optimization. Make your URL meaningful and easy to read; not filled with numbers and symbols. As I mentioned in the first point, search engines do not see web pages as we do. They cannot index images as we humans can. So in order to make them understand what a particular image means, we need to add alt descriptions in the image HTML tag. The alt tag is a must to get your images indexed by search engines. If it is not specified, they will skip right past the images without considering them a form of content on your website. Use relevant images in your article or web page so the alt tag can be your primary keyword. Always go for the right description. But don’t overdo it and stuff it with keywords – it just doesn’t work! This is a huge factor that determines how much content of your website gets indexed by search engines. The internal link structure plays a vital role in getting all your content crawled by search engine spiders. The most common error I have seen is websites using images for navigation. With no alt tags, these images will not be indexed and as a result, those internal links will not be crawled. Great content that is keyword optimized will be of no effect if it cannot accessed by search engine spiders. Much more is involved in search engine optimization but these five points are crucial and will go a long way in getting your website optimized for search engines. Today’s Action Step: Use the tactics mentioned above to make your website search engine friendly.